The Chimney is pleased to present a solo exhibition by Hiroshima-born artist Atsunobu Kohira. Since 2015, Kohira, fascinated by the properties of carbon materials, has undertaken a coal pilgrimage from the northern mining region of France, to the Wakayama southern-central sacred mountains in Japan, and finally to the infamously polluted Newtown Creek, the East River’s estuary in Brooklyn. 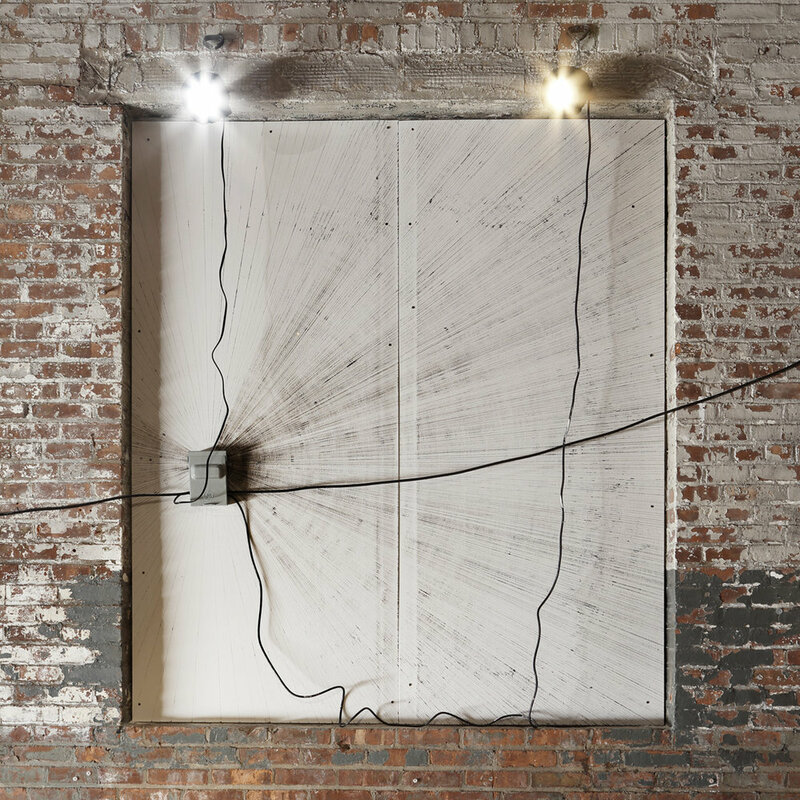 For his first exhibition in the United States, Kohira offers an installation that tangles with religious rituals and spiritual forces as well as the objects’ inner geological lives. Coal is born of a sedimentary rock formed from dead plants that accumulate over million of years. Composed mainly of carbon and hydrocarbons, this abundant combustible lives ubiquitously in Earth’s crust. While coal consumption produces energy and life at a global scale, its extraction from the ground transforms landscapes and generates detrimental environmental outcomes. In his exhibition, Kohira references this paradoxical dichotomy that the world continually addresses, but have yet to resolve. A 12ft high monolith made of plastic and bitumen erupts from the cemented ground. The rectangular cuboid’s viscous surface glistens through fluorescent lights suspended in mid-air. 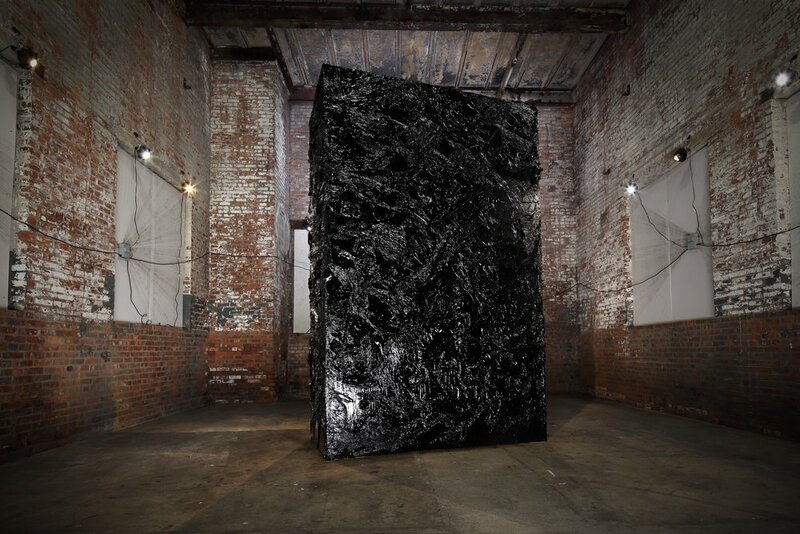 “The monolith is an assemblage of impenetrable spirits,” explains Kohira. By embodying the estuary’s geological phenomenon that borders The Chimney, the sculpture directly addresses the history of its surroundings. The Newtown creek became the 19th century industrial revolution’s cradle, with oil refineries and chemical companies dejecting their wastes in the waterway at a rate unrivaled in contemporary American history. In erecting a monument that celebrates the Earth’s extracted energy, Kohira transforms the gallery space – originally part of an abandoned distillery – into a shrine for the bleak history of the creek. The movement of the visitors is an essential aspect of Kohira’s installation. Drawing on Maurice Merleau- Ponty’s phenomenology, the artist empowers his work with a diversity of sensuous realities. 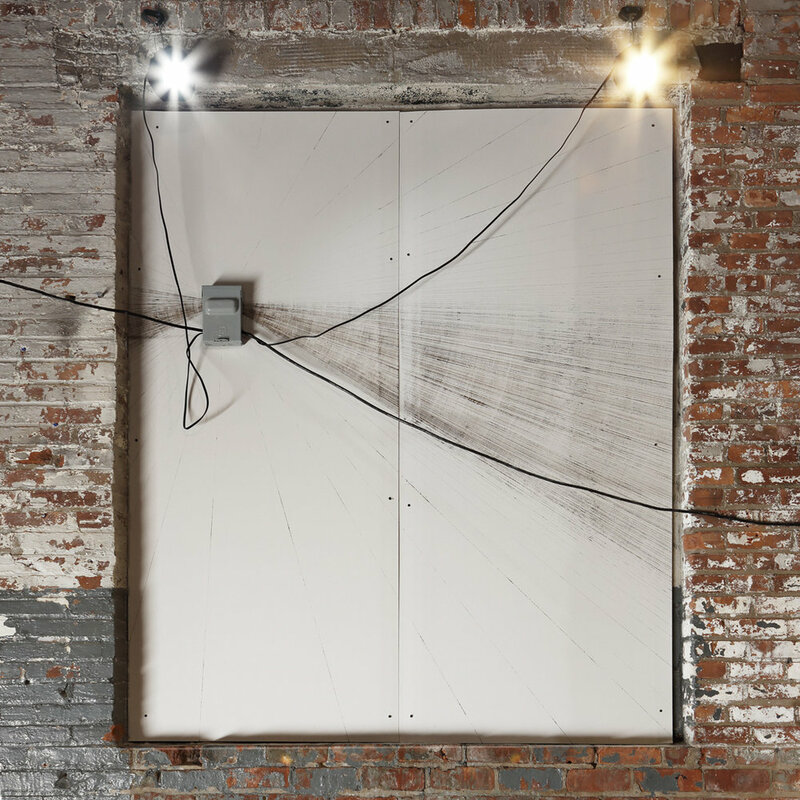 Visitors’ apprehension of the work is dictated by their bodily movements in space and infused with the smell of asphalt, both mild and stifling. 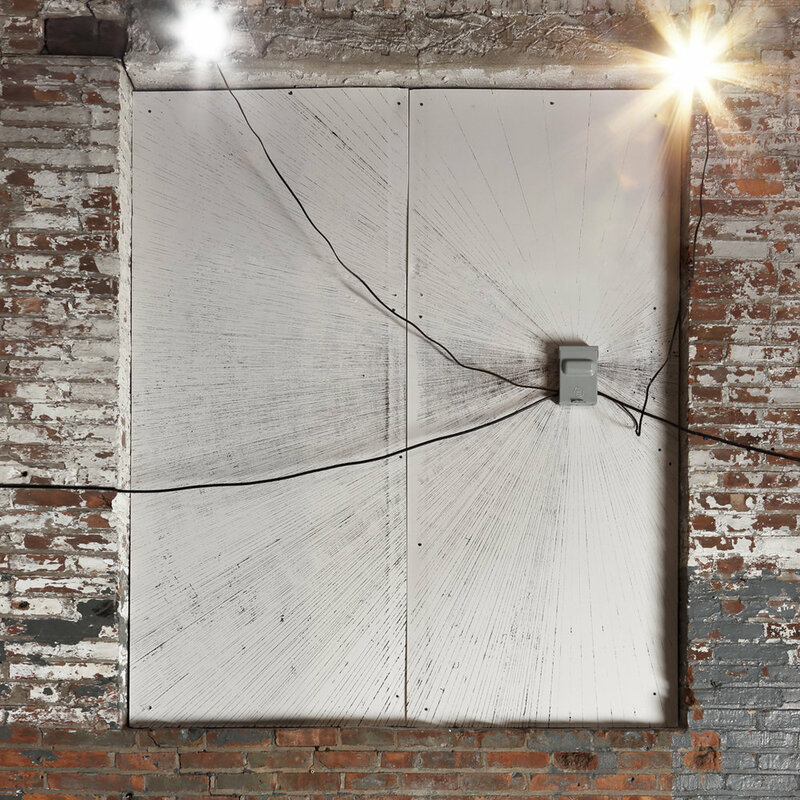 Six bitumen-paint drawings are installed in the excavated windows of the space, all connected with a 100- foot electrical cable that powers the exhibition. This wire is a borderline referencing the sacred cord in Shinto religion known as Shimenawa. Made of hemp or rice, the twisted straw delimits a sacred enclosure to ward against evil spirits in shrines. Inside The Chimney, the cord connects the past and present of The Newtown creek, all enmeshed in the Monolith. The lines, reminiscent of the first human cave markings seem generated by electricity. Kohira apprehends coal as living memory, one compressed by gravity. The physical energy released through combustion, is concomitant to a spiritual journey. In Kohira's installation, matter is perceived as complex, paradoxical and in a state of becoming, unobstructed by human agency. Atsunobu Kohira (b. 1979. Hiroshima, Japan) completed his BFA at the Ecole Nationale Supérieure des Beaux-Arts ( 2006) and his MFA at Le Fresnoy (2010). His solo exhibitions include “Carbon Variation N°1”, Yumiko Chiba Associates, Tokyo, Japan (2017); “Coalscape Ing of Coal” at Festival KG+, Kyoto, Japan (2017); “Outretemps”, Galerie Maubert, Paris, France (2016), “Carbon Lab”, at YIA Art Fair, Paris, France (20016); “Vanitas”, at Yumiko Chiba Associates, Tokyo, Japan (2015); “Pérennité passagère: at EAC Les Roches, France (2014); “Instrument pour Saint- Louis” at the Cristal Museum of Saint-Louis, France (2012)l; “Ku” at Galerie G, Hiroshima, Japan (2008); among others. His work has been included in group exhibitions at the Musée Picasso (Paris, France), Grand Palais (Paris, France), Le Palais de Tokyo (Paris, France), Hermès Tokyo (Tokyo, Japan), La Maison Européenne de la Photographie (Paris, France), la Gare Saint-Sauveur (Lille, France), Paris Photo (France). Office Magazine, Creature from the Black Lagoon, Interview of Atsunobu Kohira by John Martin Tille. September 22, 2018.